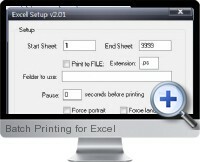 Batch Printing for Excel (Batch and Print Pro) is an application for management and automation of batch printing multiple documents of common formats with advanced printing parameter specification. The Excel add-in for the batch printing application is available to manage and control printing of multiple worksheets and ranges from within Excel. Batch Printing for Excel monitors the spool queue of printers for seamless sequence printing as well as directory monitoring, FTP and POP3 email monitoring, automatic scheduling of print jobs, printer load balancing, pre-processing for converting PDF to Postscript without Acrobat and more. Batch Printing for Excel is ideal for gaining efficiency in any printing process management and providing powerful automated reporting for business purposes. The master program interface has power features including drag and drop of files, save/load/append to batch lists, list ordering options, refresh lists to pickup new files, page separator between files option, batch file replication, command line, compressed file support, logging, reporting, and email notification. Print directly from Excel using the Excel API. Print multiple ranges in multiple worksheets in one batch command. Counts worksheets and printed pages in an Excel workbook. Allows specific pages to be printed through a custom file name command. Print to file option such as PS, PCL and PRN. Specify pause seconds before printing to allow for rendering time. Specify the number of copies to be printed.